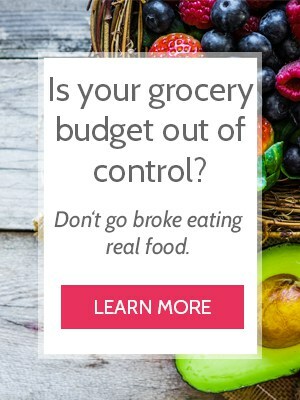 One of the classic pieces of advice for trimming grocery budget spending to buy in bulk, and I followed it faithfully for a long time. But then we moved. ALDI was just down the street and a trip to Costco meant inconvenient hours and fighting traffic. I chose convenience, thinking I wouldn’t be saving much anyway, and I was sorely mistaken. March’s grocery budget report inspired me to try shopping in bulk again, despite Costco being out of the way. I’ve been on an over-budget streak since moving to Georgia, and April was my official “last ditch effort” so to speak, to REALLY hone in our grocery spending again. I talked to Mr. Crumbs. I inventoried my pantry, fridge and freezer. I looked at all the circulars. 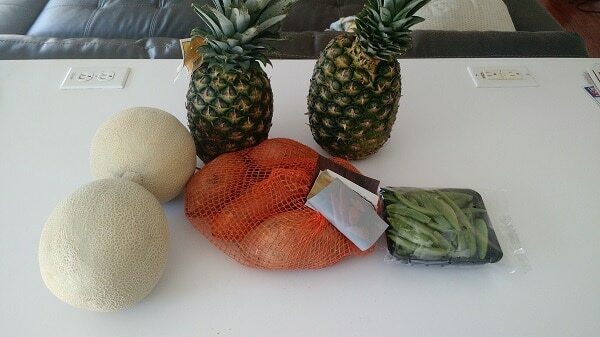 I shopped bulk at the beginning of the month, then once a week thereafter. We ate every single leftover (no matter how odd it might have been) and threw nothing away. We hosted company for dinner one night (3 extra mouths), and we hosted family for 5 days (5 extra mouths). How exactly did we make 28 extra meals AND STILL come in at budget? Here’s my grocery budget spending report! This was the very first trip of the month (bulk first, remember?) and the best items to buy in bulk are the ones you eat all the time. For my family, that’s peanut butter (we make chewy peanut butter chocolate chip granola bars weekly), cashews (husband snack), cheese (grilled sandwiches, salads, snacks), canned tomatoes (easy pizza sauce and creamy tomato soup), coffee, carrots, apples and onions. A few of the non-staple items include anchovies, romaine and Parmesan for various Caesar salads; jarred peaches because my son LOVES peaches and milk on his oatmeal, pretzel sticks as a treat for the kids, spinach for a spinach pesto recipe and smoothies. It’s worthy to note that before I went shopping at Costco, I looked over all my receipts for the year so far and wrote down how much the item cost per ounce at ALDI next to the item on my shopping list. That way I knew whether or not Costco was cheaper than ALDI as I was shopping. Then I took all my numbers, crunched them up and wrote the mind-blowing post on which is cheaper, Costco or ALDI. It’s official – we’re a 3 chicken family. My goal is to serve one chicken each week, with another roast of some sort the remaining week. For April, we already had a pork roast in the freezer leftover from a previous month, so it was just chickens to fill the freezer. Again, since this is part of the big monthly shopping trip, you’ll find lots of staples and multiple quantities to get us through the whole month. Some of the pantry staples include pasta, pepperoni and mozzarella for homemade pizzas on Friday, butter, string cheese for school lunches, red potatoes for dinners, diced tomatoes and bacon. A few things I bought specifically for our meal plan were frozen spinach and cream cheese for spinach alfredo, grape tomatoes and yogurt and lemons for various Caesar salads, chocolate chips for the aforementioned granola bars and also these amazingly delicious black bean brownies. See oats on the list? I normally buy these in bulk because we eat a lot of them. However, there were enough oats in the pantry to get me through most of the month. Since a full 10 lbs wasn’t needed, I bought a smaller package to reduce the actual money spent. This trip was made almost a full week after the big monthly shopping trip. The kids were going to be on spring break the week after, so I needed to have plenty of produce available for snacking and I wanted to take advantage of the weekly sales at ALDI. This was opening weekend of the farmer’s market in my town and beyond an exploration trip, we needed some not-staple veggies! I used the chard to make savory pasta with bacon and chard, roasted the turnips one night, made delicious salads with the lettuces and topped them with green onions. And you bet I’m regrowing my onions in a glass of water! 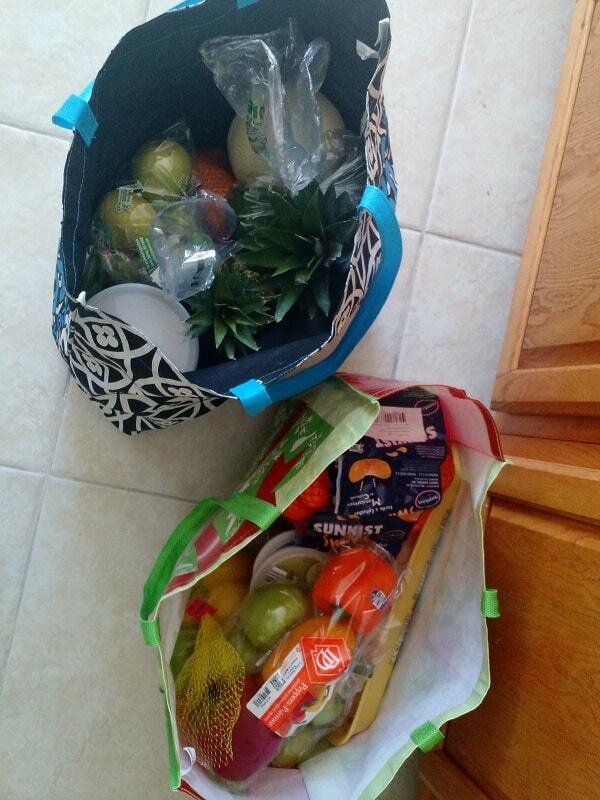 Although it seems like multiple trips, the previous ALDI and farmer’s market trips were made on the same day. This trip to Costco was not originally intended for groceries, but I picked up maple syrup wince we were there. If we hadn’t already been at Costco, I would have likely done without. We’re now on the third week and although I didn’t NEED any of these items at that particular moment, they were on my list for later in the week and I didn’t think I could get a couple of these things from ALDI. Plus I was already at Walmart for a different reason anyway. Peanuts were to experiment with a different flavor of granola bar, vital wheat gluten is for a couple of bread recipes but also to make our own bread flour (add 1 Tbsp to 1 cup all-purpose flour). Chili powder for the spice cabinet, tomatoes for the pantry and milk for coffee and making kefir. This trip was my “official” week 3 shopping trip and as you can see, it was mostly produce. 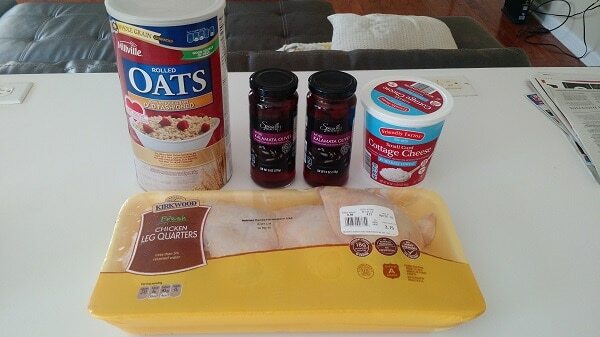 I shopped the sales at ALDI to have tons of fresh produce for the week, but also picked up chicken leg quarters for additional lunches, feta and kalamata olives for Greek dishes, eggs and sweet potatoes for the best breakfast ever and cottage cheese to boost the protein in our smoothies. If we didn’t have 5 family members coming in town for 5 days, I know we would have been just fine with what we already had in the house. 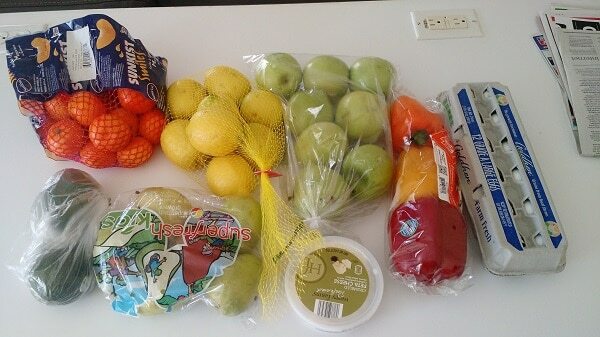 But because we were hosting, I picked up some extra items to have ready for meals. The cantaloupe was largely for snacks. Mozzarella, blue cheese, yogurt and pepperoni for buffalo chicken pizza. Whole chickens to grill for dinner, served alongside potatoes. Italian cheese (I believe this was Parmesan) for Caesar salads. This trip was also for company, but I had forgotten these items at ALDI the day before and we were at Costco anyway. Apples for snacking, lettuce for salads. 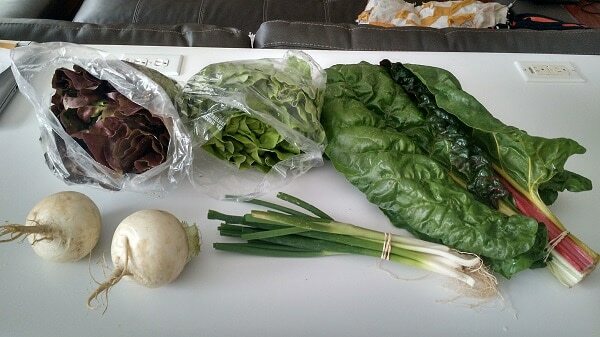 This trip was the very last day of the month, intended to be enough produce to hold us over through the whole first week of May. Aside from snacking and meals, the flour was for homemade bread and pizza dough. My monthly grocery budget is $330 for four people and while I was over by $16 this month, this is the first month where I’ve even come close to hitting my budget after moving to Georgia and I’m so very excited about this! Next up – evaluation time. I’ll leave mine here – you leave your thoughts/comments/ideas in the comment section below and I’ll reply. 1. Shopping in bulk at the start of the month – at Costco – saves money. It was this realization that inspired me to keep track of the top items I buy at both ALDI and Costco to truly see which was cheaper. According to that post, I would save nearly $80 by shopping Costco first. The fact that I was able to make an extra 28 meals this month is proof in the pudding that shopping at Costco at the beginning of the month helps to keep me within budget. 2. Shopping once a week saves money. There were a few additional trips in there when I was at a store for something else entirely, but for the most part, I strictly shopped once a week for my family and the resistance to run out for one or two items paid off. 3. Shopping monthly and weekly forces me to be intentional. 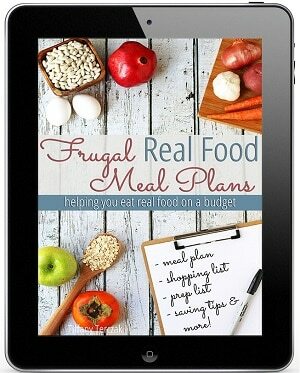 Intentional with creating meal plan, when creating the shopping list, while shopping and as we eat throughout the week. Every shopping list, both monthly and weekly, needs to cover the appropriate time span. If I forget something, it gets postponed to the following weekly shopping list. Or we do without. 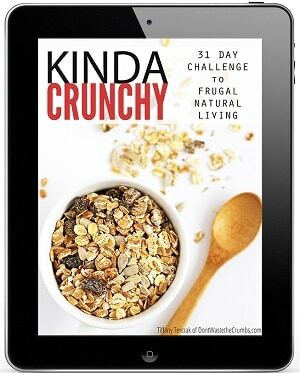 How did you do on your grocery budget spending for April? I have to admit, I love reading these end of the month spending posts. They help me to see how I’m soing by comparison, and how I can improve. 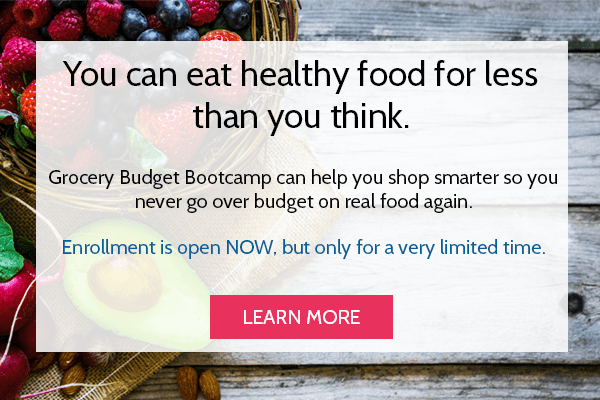 I do have a question: do you tend to meal plan before or after you shop the sales? I’ve read of people doing it both ways, and I do it beforehand and try to match my shopping to what I need. But I wonder if it saves money to shop sales first, then meal plan with what you’ve bought for the week? Any suggestions would be helpful! Thanks, as always. You rock! I LOVE reading your end of the month recap. It challenges me to stay on track and in budget!! Thank you for always sharing. I do not have a Costco or Sam’s membership (My mom does have a Sams) so I go with her. I wish it was a Costco (but she gets the free membership from her sister so we don’t complain). However, for April I spent $291.13 which is under my $300 a month budget. So I did well for April and we had extra mouths to feed several times because of projects my husband and I had/have going on. I always feed our help. GREAT JOB TIFFANY!!! I read your last several grocery budget recaps, and a lot of people thought the increase in spending was due to your new location. 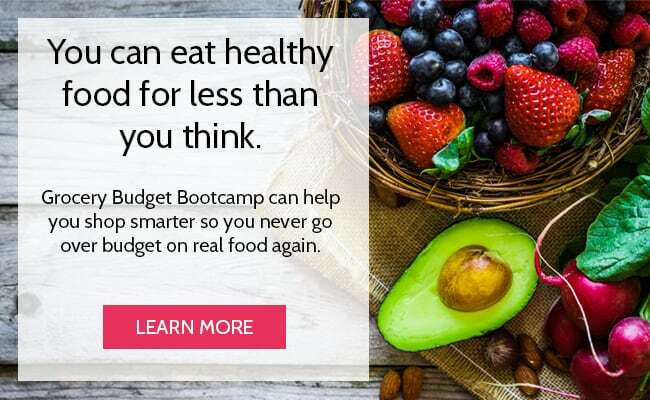 Your determination and hard work just prove that it’s possible to stay within your budget and still feed your family real food no matter where you live! Not to mention – you had a considerable amount of company! Thank you! I honestly though we might have to increase our budget because of our new location too, but as it turns out, it’s still possible when I’m very intentional with our shopping! I am fairly new to Crumbs and it seems that you don’t eat much red meat. Is that intentional as a cost saving strategy? Hi, I just found one of your posts through Pinterest. Your meal plans all look lovely. I’m not sure how well they would go over with my family. I would probably need to double everything since we are a family of seven with four growing boys! 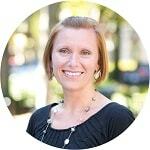 My question is, do you find that there is enough protein in your meal plans? I will continue to look around and see what I can incorporate into our monthly plan. Thanks so much.